Is your healthcare facility compliant? 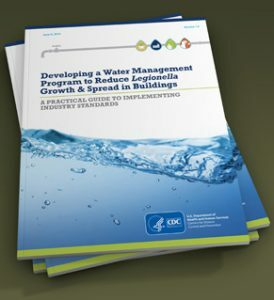 The Centers for Medicare & Medicaid Services (CMS) recently issued requirements for healthcare facilities to develop and implement Water Management Plans for premise plumbing and cooling towers, in order to prevent infection by Legionella and other opportunistic pathogens from building water systems. Do you have a Water Management Plan? Is it being implemented and documented? Are you ready for the CMS surveyors? If you are unsure, VERTEX can help! Learn more about our Building Water Systems Risk Management & Compliance Services or submit your contact information below to have one of our experts reach out to you. 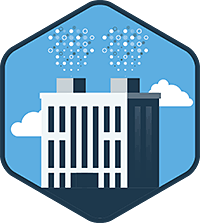 Cooling towers, which are often part of the air conditioning systems of large buildings, are a common source of Legionella exposure in outbreaks. Cooling towers need to be properly maintained in order to prevent Legionnaires’ disease. The bacterium Legionella can cause a serious type of pneumonia called LD in persons at risk. Those at risk include persons who are at least 50 years old, smokers, or those with underlying medical conditions such as chronic lung disease or immunosuppression. Outbreaks have been linked to poorly maintained water systems in buildings with large or complex water systems including hospitals and long-term care facilities. Transmission can occur via aerosols from devices such as showerheads, cooling towers, hot tubs, and decorative fountains. Facilities must develop and adhere to policies and procedures that inhibit microbial growth in building water systems that reduce the risk of growth and spread of Legionella and other opportunistic pathogens in water. What Is Legionnaires’ Disease (LD)? 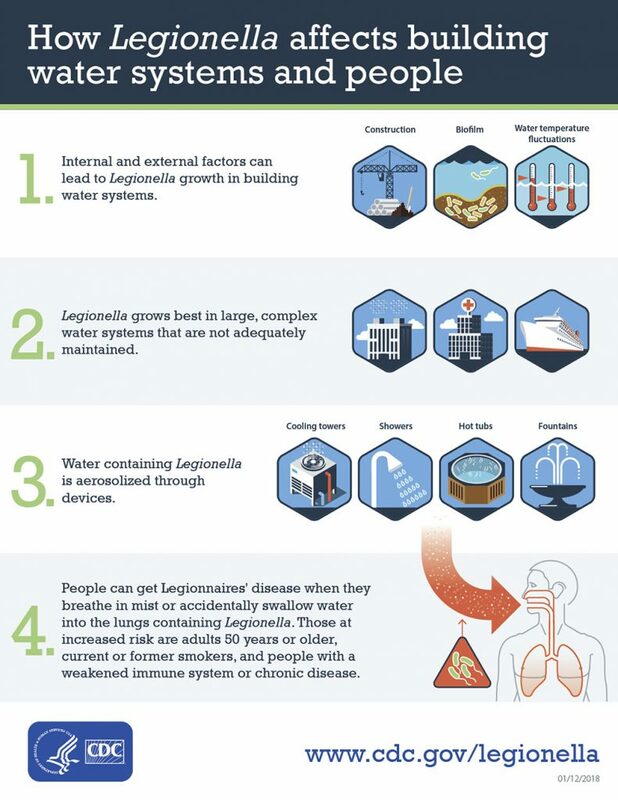 LD, a severe sometimes fatal pneumonia, can occur in persons who inhale aerosolized droplets of water contaminated with the bacterium Legionella. In a recent review of LD outbreaks in the United States occurring in 2000–2014, 19% of outbreaks were associated with long-term care facilities and 15% with hospitals. The rate of reported cases of legionellosis, which comprises both LD and Pontiac fever (a milder, self-limited, influenza-like illness) has increased 286% in the US during 2000–2014, with approximately 5,000 cases reported to the Centers for Disease Control and Prevention (CDC) in 2014. Approximately 9% of reported legionellosis cases are fatal. Legionnaires’ disease is a serious type of pneumonia caused by Legionella bacteria, which live in water. People can get sick when they inhale water contaminated with Legionella. Maintaining building water systems is key to preventing Legionnaires’ disease. 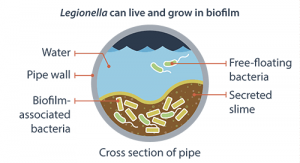 Owners and managers of buildings at increased risk for growing and spreading Legionella can protect people by developing a water management program. What Are Legionella Water Management Programs? Legionella water management programs identify hazardous conditions and include taking steps to minimize the growth and spread of Legionella in building water systems. Having a water management program is now an industry standard for large buildings in the United States. Use the toolkit’s quick yes/no worksheet to find out if your building or certain devices in your building need a water management program. Legionella, the bacterium that causes Legionnaires’ disease, occurs naturally in freshwater environments, like lakes and streams. Generally the low amounts of these bacteria in freshwater do not lead to disease. However, Legionella can pose a health risk when it gets into building water systems. To do this, Legionella first has to grow (increase in numbers). 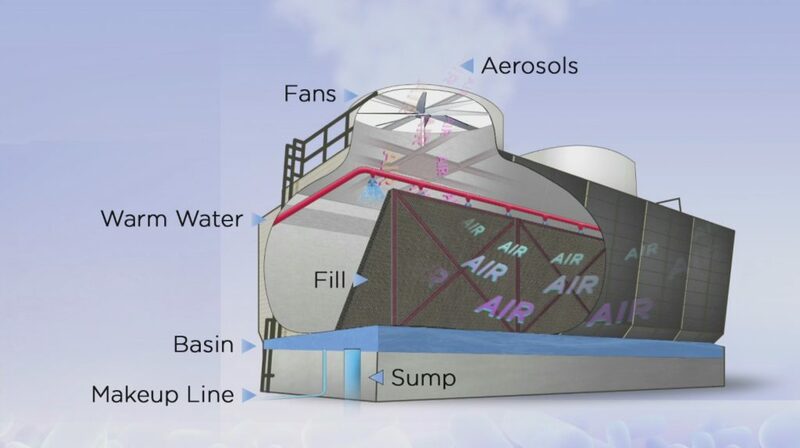 Then it has to spread through small water droplets (aerosolization) that people can breathe in. You can take steps to reduce the risk for Legionella in your building.